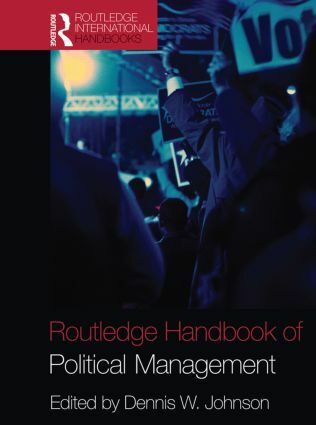 The Routledge Handbook of Political Management is a comprehensive overview of the field of applied politics, encompassing political consulting, campaigns and elections, lobbying and advocacy, grass roots politics, fundraising, media and political communications, the role of the parties, political leadership, and the ethical dimensions of public life. While most chapters focus on American politics and campaigns, there are also contributions on election campaigns in Europe, the Middle East, Russia, Australia, East Asia, and Latin America. In addition to a thorough treatment of campaign and elections, the authors discuss modern techniques, problems, and issues of advocacy, lobbying, and political persuasion, with a special emphasis throughout the volume on technology, the Internet, and online communications as political tools. Grounded in the disciplines of political science, political communications, and political marketing, the Routledge Handbook of Political Management explores the linkages between applied politics and social science theory. Leading American and international scholars and practitioners provide an exhaustive and up-to-date treatment of the state of this emerging field. This publication is a major resource for advanced undergraduates, graduate students, and scholars of campaigns, elections, advocacy, and applied politics, as well as for political management professionals. What Drives the Cost of Political Advertising? Mexico’s 2000 Presidential Election: Long Transition or a Sudden Political Marketing Triumph?